My Second Life day always begins, with a hunt for the dog. Each morning our dog manages to get off our sim and wander until I get that dreaded “I am lost” message….lol! He basically only obeys my partner, yet Conte is not the one who owns him!!! Our Harley is like that “where’s Waldo character, as each morning we have to find him! That is the running daily joke in our family. But today he is patiently sitting, waiting to be walked, and played with, while I preen myself for the camming neighbors, who are checking out my stylish GizzA Creation’s garb. I have put together a fun and flirty look featuring some of my favorite items from GizzA. I am wearing my Moto Leather Jacket, which is sheer biker chic, in Black Leather that is accented with brass studs and zipper, with raised quilted accents upon the upper sleeves. The leather is as supple as melted butter! Underneath it I am sporting the sleeveless, cropped tank top, from the Rebel Summer Set. This comes with a 12 color Texture Changer Hud for the tank and a 4 color selection for the Denim Bootie Shorts. I thought it was so cute to choose MEOW, for my top’s message, since I am walking the dog…which explains his barking at me…laughing! To all of this fabulousness, I have added my Urban Princess Tutu skirt. OMG, I absolutely LOVE this skirt!!! It is a above the knee length Ballet Tutu Skirt, (I wear a longer one in real life with a jeans jacket). It has a 9 color Texture Changer Hud, with some of the most awesome colors and comes with a pushed up sleeve, Turtleneck Top, also in warm, wonderful colors! I love how the tulle skirt switches around me when I am walking or dancing, so totally feminine! I have accessorized my look with the Boudoir Immersive Butterflies Veiled Headpiece gift, which is no longer available and the Slink Lulu White Stiletto. I wave to my neighbors as I see their camera hairs upon me and im them to tell them where GizzA is located! Time to take our rambunctious Harley out to play, so he can push me half way across the sim! I wish you’ll a awesome and enjoyable weekend! A hunt, a hunt, Belle is part of the hunt! No time to wait, no time to tell…Belle is part of the hunt! What hunt you ask, why the Twisted Hunt! No need to sail the seven seas or fight a beast alone, make your way to Chop Zuey and become the victor among us all! Your quest, I see, has brought you to Chop Zuey, to find the prize that undress your desire to possess, The Chains of Calypso Set. No doubt your reward for your search will be great, as you find and claim your Chains of the Calypso Set! The lust of this glorious set, has baited you on your quest, to be adorned as a goddess blessed in this most exquisite set! A Twisted Hunt you are on! Be brave on this quest, slay the lag monster who protests, resist the siren call of beauties who stand tall, as you persevere to be deemed worthy to win from the Goddess of Mount Chop Zuey, The Chains of Calypso, her offering for all! Good Luck to all you mighty hunters of the Chop Zuey’s Chains of Calypso Set! 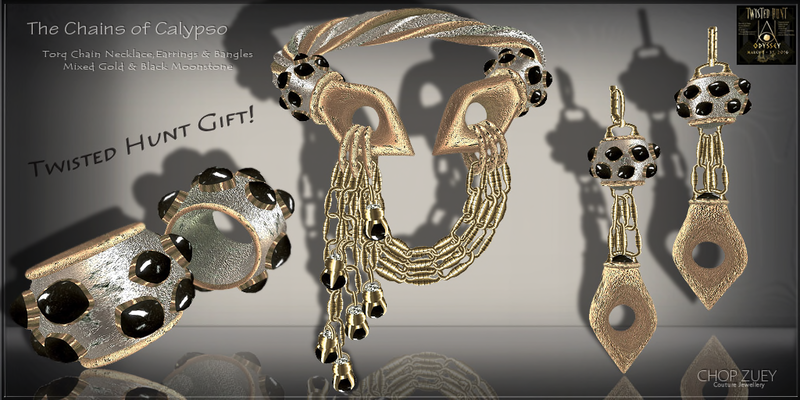 It is a beautifully crafted bold suite consisting of the Torq Necklace, Bracelet, and Earrings, set in a mix Gold setting and adorned with Black Moonstones.